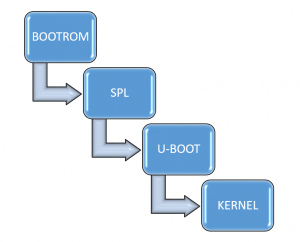 Falcon mode is a feature in u-Boot that enables fast booting by allowing SPL directly to start Linux kernel and skip completely u-boot loading and initialization. This is the primary program loader residing on a read-only flash memory (ROM) integrated directly into the processor chip. It contains the very first code which is executed on power-on or reset. Depending on the configuration of the bootstrap pins or internal fuses it may decide from which media to load and run the next piece of software. In case of a Secure Boot processor it will also verify the code authenticity before its execution. At this stage, Boot ROM code is not aware about memory type and different interconnected peripherals. The main goal here is to perform basic peripherals initialization such as PLLs, system clocks setup then find a boot device from which load a bootloader such as u-Boot. A typical u-Boot image is around few hundreds KB size (~300KB) which does not fit inside internal SRAM of most ARM processor. They are typically less than 100KB. To handle this limitation, u-Boot adopted the SPL (Secondary Program Loader) approach which consists of creating a very small pre-loader that after configuring and initializing peripherals and the main system memory can load the full blown u-Boot. It shares the same u-Boot’s sources but with a minimal set of code. So when u-Boot is built for a platform that requires SPL, it generate two binaries : SPL (MLO file) and u-Boot image. Das u-Boot aims to offer a flexibel way to load and start the Linux Kernel from a different type of devices, it also provides rich features for a bootloader, such as a command line interface, Shell Scripting, Support of a variety of Filesystems, networking and other options that are very helpful during initial Hardware Bring-Up and development process, but can be bypassed for the production by enabling the Falcon-Mode and save by the way some precious seconds of the boot time ! We will use a Beaglebone Black as hardware example to showcase the setup, booting either from an eMMC or SD Card. Nevertheless the procedure should be almost identical to other ARM based boards supporting the SPL framework. If Boot Rom Code support it, we recommend to store and boot the SPL from raw partition and by this mean also u-Boot and Linux Kernel to skip the overhead of using a Filesystem. As result the boot is even faster ! 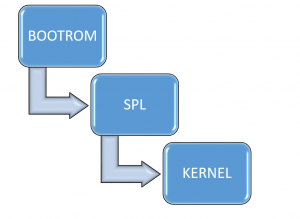 SPL* offset is the address from which the Boot ROM can fetch bootloader. This address is hard coded in the Boot ROM and specific to processor. In case of AM335x there are 4 possibilities at 0x0, 0x20000,0x40000, 0x60000 [chapter 26.1.7.5.5 in the technical refrence manual ]. If everything went well, MLO and u-boot.img files should generated in the top directory. 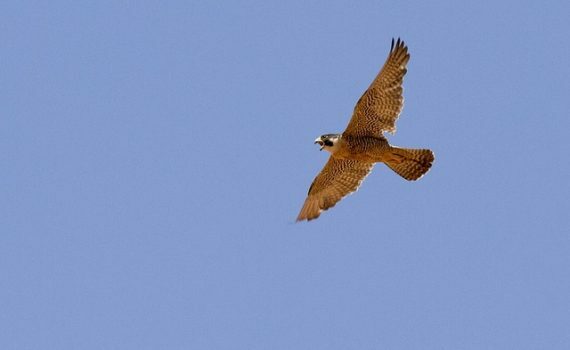 Note that Falcon-Mode supports only uImage Kernel format ! [0.000011 0.000011] [0.000206 0.000195] U-Boot SPL 2017.05-rc3-dirty (May 04 2017 - 22:01:09) [0.093199 0.092993] Trying to boot from MMC1 [1.434341 1.341142] systemd 230 running in system mode. (-PAM -AUDIT -SELINUX +IMA -APPARMOR +SMACK +SYSVINIT +UTMP -LIBCRYPTSETUP -GCRYPT -GNUTLS +ACL +XZ -LZ4 -SECCOMP +BLKID -ELFUTILS +KMOD -IDN) [1.449622 0.015281] Detected architecture arm. [1.452503 0.002881] [1.452528 0.000025] Welcome to Embexus-Linux 1.0 (Guacamole)! [1.449622 0.015281] Detected architecture arm. [1.452528 0.000025] Welcome to Embexus-Linux 1.0 (Guacamole)! In other articles we will cover further techniques used to achieve a Faster Linux Boot, stay tuned !